We wanted some variation in character work times to smooth out the huge dip in night time productivity (and activity) and to space out some of the spikes in demand for resources (food, bed space), but with arbitrary shift controls, players would be motivated to either basically overlap all of their workshop worker shift times or slightly stagger them for optimal output, and that’s a decision that would rarely change. If a choice only needs to be made once and only in the correct way, why is it an interesting choice? The barracks provided a great example, though, of a work shift that was important to be able to control (day vs. night patrol), but other than that we’re basically at a point where there’s no great strategic depth to arbitrary workshift control. So we removed arbitrary shift control. Now, for most buildings, characters work shifts that are defined by the building type. Service buildings have more hours in the evening, workshops more hours in the morning (and they now take tea time off because it just felt right). 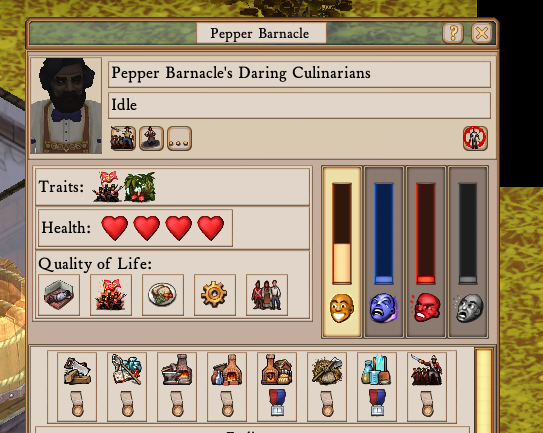 Barracks are treated slightly differently, where the barracks UI allows players to select a morning or an evening shift, and they’ll work it straight through. 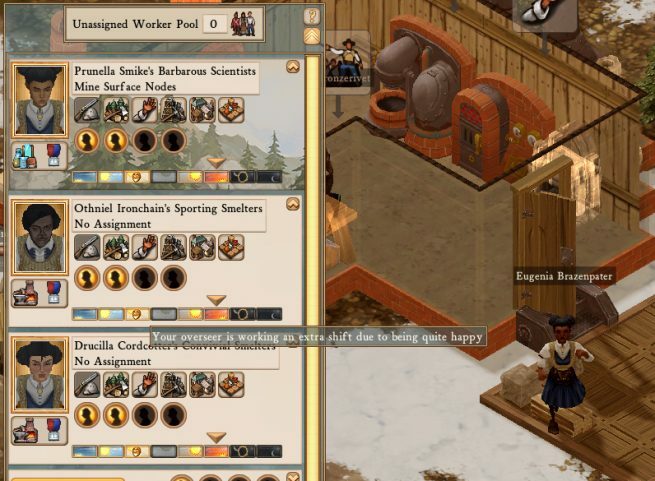 The UI now also indicates if a crew could be working more if they were happier, and if they’re working less than they could it indicates why. One of the issues with the UI that we’ve found with all of the feedback we’ve received since the beta launch has been that we’re not giving players great feedback about when crews are off-shift though. This is getting better, but more work is being done, so expect a bit more tweaking on this in the next few experimentals! Well, that seems sensible. Thinking about it, I don’t think I’ve ever actually changed a shift. Glad you are making this change. Thanks! I always thought this was weird they could work without light.